Elections in Bosnia and Herzegovina once again handed control to rival nationalists. But low turnout and weak social movements also show how institutionalized sectarianism hollows out democracy. For its most famous poet Branko Ćopić, Bosnia and Herzegovina is a country full of magic, a country in which elves are haunted by dragons. Since the bloody civil war in the 1990s, it is also a country in which citizens are haunted by a so-called comprador bourgeoisie, i.e. one whose power rests on its international ties. Organized into a multitude of mostly nationalist parties, this comprador bourgeoisie has exploited the entire country economically, politically, culturally, morally, and institutionally. The legislative framework facilitating this exploitation was provided by the peace agreement signed in Dayton, Ohio in 1995, which gave the country an ethno-national foundation. Since that point, the state has been made up of two separate political entities, namely the Republika Srpska (“Serb Republic”) and the Federation of Bosnia and Herzegovina (considered home to Muslims and Croats). This arrangement has wound itself around the country like a boa constrictor, choking off literally every instance of emancipatory resistance, however small. Portrayed as the only viable solution to conflict, this order is regarded by the international community as Bosnia and Herzegovina’s only legitimate form of sovereignty. Interference from neighboring Croatia and Serbia has also proved disastrous. Not only do these states call Bosnia and Herzegovina’s territorial integrity into question — sometimes openly, sometimes through veiled allusions — but particularly during election seasons, both states instrumentalize the Croat and Serb populations living within the country for their own domestic political purposes. They finance and support Croat and Serb nationalist parties within their neighbor and place themselves above its constitution, as they please — for instance, when an election result turns out differently from what think tanks in Zagreb and Belgrade had hoped. Meanwhile, the political elite of the Bosnian Muslims, the majority of whom are organized in the Party of Democratic Action (SDA), views the country as its own property. It acts as if it were the only political force advocating for the entirety of the state, yet at the same time mercilessly exploits the country, privatizing all available resources to serve the interests of the party machinery itself. The presidential and parliamentary elections held in Bosnia and Herzegovina on October 7, 2018 confirm these patterns, but also point beyond it. For external observers, what and whom the approximately 3.3 million-person electorate was voting for might not be immediately clear. The structure of the state is, indeed, very complicated. Up for election were the national parliament, the so-called “entity” parliaments of the Republika Srpska and the Federation, and the representatives of the three-person presidency, which consists of one representative for each of the country’s Bosnian Muslim, Croat, and Serb populations. Moralistic media narratives fail to recognize that nationalism has been politically mainstream precisely thanks to neoliberalism’s uninterrupted ideological hegemony. The presidential election dominated both national and international political coverage even though the office does not possess far-reaching authority. Yet in spite of its trivial relationship to practical politics, the three-person presidency provides a sort of condensed image of the political system of Bosnia and Herzegovina, in which an even marginal shift within the architecture divided up between the competing nationalist interests triggers downright panic within the political establishment. Within the Federation of Bosnia and Herzegovina (the entity ostensibly belonging to Muslims and Croats), voters could cast a ballot for the Muslim and Croat representatives to the presidency. In a close result, this race was ultimately won by Šefik Džaferović, the candidate of national-conservative Muslim SDA, who with just under 37 percent of the votes came in two percentage points ahead of his challenger, Denis Bećirović of the Social Democratic Party of Bosnia and Herzegovina (SDP BIH). The election of the Croat representative to the presidency attracted more attention. Željko Komšić of the social democratic–oriented Democratic Front (DF) won 55 percent of the votes, easily triumphing over the incumbent Dragan Čović of the national-conservative Croatian Democratic Society of Bosnia and Herzegovina (HDZ BIH), who came in at slightly less than 35 percent. In the Republika Srpska, the electorate could vote for the Serb representative. Unsurprisingly, Milorad Dodik of the national-conservative Alliance of Independent Social Democrats (SNSD), the dominant party in this entity, won with 54 percent of the vote. In Bosnia and Herzegovina, where fifteen parties and electoral alliances managed to break the 3 percent threshold to enter parliament, the mostly nationalist establishment parties remain the best-represented forces in both the national and entity parliaments. Even though no certain predictions can be made regarding potential coalitions, it appears safe to say that the national-conservative SDA, HDZ BIH, and SNSD will enter into a transactional coalition on the national level as they have in the past. It would also be mathematically possible for the SDP BIH to form part of a coalition, yet potential partners such as the Democratic Front explicitly rejected this possibility in the run-up to the vote. Indeed, a coalition with the major national political players would only further accelerate the decline of Bosnian and Herzegovinian social democracy. In former Yugoslavia, Bosnia and Herzegovina was regarded as a multinational success story, a Yugoslavia in miniature. The Yugoslav struggle for national liberation during World War II, organized and led by the Communist Party of Yugoslavia, would not have succeeded without the unified action of all nationalities. From Sutjeska to Neretva, the major battles fought by the Yugoslav partisans all took place within the territory of Bosnia and Herzegovina, as did the two meetings at which the general structure of the Antifascist Council for the National Liberation of Yugoslavia was decided. However, Croatian and Serbian fascists, the Ustashe and the Chetniks, also wrought havoc in Bosnia and Herzegovina in their attempt to incorporate it into Greater Croatia and Greater Serbia. Among other reasons, the civil war in the 1990s escalated because resurfacing revanchist aspirations were both directly and indirectly supported by Zagreb and Belgrade. At the same time, however, the antiwar movement was strongest in Bosnia and Herzegovina. Insofar as non-nationalist political alternatives were anywhere somewhat successful at the end of the 1980s and in the early 1990s, it was here that this was the case. Whereas the pan-Yugoslavian television station YUTEL stopped broadcasting in Croatia and Serbia because the nationalist leaders of those countries rescinded its license, it continued to air in Bosnia and Herzegovina. Yet the ethnic division of the country imposed by the military during the war has now been cemented by the Dayton Accords, which continue to reverberate to this day. The second ideological leg holding up the state and social system, apart from nationalism, is a peripheral neoliberalism that has dismantled the country’s entire economic infrastructure over more than twenty years of privatization. Through their political parties, the national elites have massively profited from this process, and in fact even helped to initiate it. The term “ethno-business,” commonly used in Bosnia and Herzegovina, is meant quite literally. And yet particularly after this election, Bosnia and Herzegovina does not constitute a unique case politically. Rather, it confirms trends which are also observable in other capitalist societies: the influence of privileged elites increases, formally existing democratic institutions are “emptied” of their political content, and a crisis of representation develops. This development is notable in the election of the Croat member of the presidency. Both the second-place Dragan Čović with his decrepit, personalized party apparatus, as well as the political and media mainstream in Croatia, declared the election illegitimate. This effectively meant denying the citizens — who elected the left-liberal Željko Komšić — their constitutional right to vote for the candidate of their choice. Only a Croatian nationalist, so the logic goes, could represent the Bosnian Herzegovinian Croats, and such a candidate should exclusively be elected by Croats in order to be considered representative. In turn, Željko Komšić cannot be considered representative, because Muslims, Croats, and probably even Serbs voted for him. In contrast to this view, a glance at the voter turnout (slightly over 50 percent) poses the question of representation on a much more fundamental level – in the municipality of Maoča, with a population of roughly three thousand, voter participation stood at zero percent! Electoral statistics also show that despite the extensive campaign support provided by Croatia’s president Kolinda Grabar-Kitarović and its prime minister Andrej Plenković, the Croat-nationalist establishment’s candidate Dragan Čović won only a quarter of registered Croat voters in Bosnia and Herzegovina. In light of this information, moralistic commentaries in local, regional, and international liberal media attributing the virulent nationalism in Bosnia and Herzegovina to Balkan cultural backwardness appear particularly trite. In fact, they fail to recognize that nationalism has long been politically mainstream precisely thanks to neoliberalism’s uninterrupted ideological hegemony. 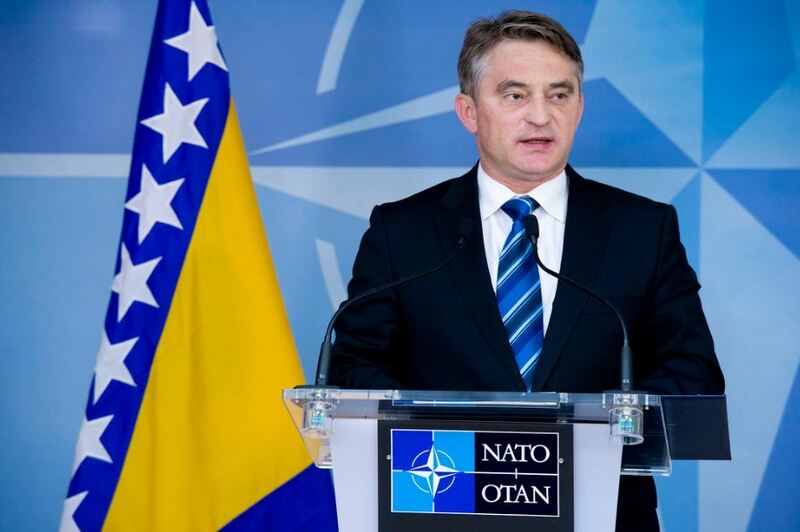 Moreover, the election of Željko Komšić reveals that a considerable portion of the citizens of Bosnia and Herzegovina who actually voted do possess enough agency to oppose the omnipresent nationalist discourse. When the votes won by the social democratic party and a number of smaller, non-nationalist parties are also taken into account, it appears that the main problem is not nationalism but rather the lack of political alternatives capable of engaging the half of the electorate that chooses not to vote. This brings us to the fundamental problem not only with Željko Komšić and his Democratic Front, but with left-liberal political formations in general: public emphasis on anti-nationalism aside, such formations display a striking political weakness in their failure to articulate solutions to structural socioeconomic problems and appeal to people outside of urban centers. The main problem is not nationalism but rather the lack of political alternatives capable of engaging the half of the electorate that chooses not to vote. For example, the DF, most of whose membership and activist base consists of disappointed social democrats, focuses its public appearances and its program above all on a critique of the ethno-national structure of the state, sacrificing in the process a distinct political identity of its own. In economic, social, and foreign policy it fails to propose alternative development strategies, instead limiting itself to familiar mainstream talking points like the need to join NATO and the EU and promoting a friendlier climate to attract foreign direct investment. Yet a similar ideological substrate exists in practically every party program in Bosnia and Herzegovina, and above all in the programs of the national-conservative SDA, HDZ BIH, and SNSD. Thus, left-liberal formations like the DF or the SDP operate within the familiar hegemonic discourse, contributing to the crisis of representation as it unfolds. Because they effectively confirm the systematic lack of alternatives, they fail to politically engage those who feel ignored by the establishment parties. Moreover, they deprive themselves of the ability to form substantive, sustainable, and politically positive alliances with social movements, radical left collectives, and citizen initiatives. In 2014, a wave of protests swept through a number of cities and led to a powerful demand for direct democracy. These were combated and ultimately defeated by the established national parties, but were also let down by the passivity and indifference of the liberal left. A similar situation is underway at present with the protests in Banja Luka, where on October 5, only two days before the election, up to forty thousand people from across Bosnia and Herzegovina took to the streets to support the father of a young man who had been murdered. The father had been going to the main square of Banja Luka every day since March 26 to demand that the Republika Srpska authorities provide an explanation for the murder of his son. The protesters not only joined his demand but went further, accusing the entire Republika Srpska political establishment of being the main culprit for their own unsustainable living conditions, in so doing displaying an impressive level of class consciousness. The protesters’ demands are clearly broader in their social and political scope than the typical party programs in Bosnia and Herzegovina. This group of forty thousand almost certainly did not vote for Milorad Dodik and his SNSD or one of the other nationalist parties. They do not need Željko Komšić or his Democratic Front, the Social Democratic Party of Bosnia Herzegovina, or any of the opposition parties represented in the Republika Srpska to see through the institutionalized ethno-nationalism. They need a credible social alternative — an alternative that remains absent for now in Bosnia and Herzegovina. The radical, extra-parliamentary left in Bosnia and Herzegovina is only a marginal phenomenon. Often it is internally divided, and so far it has lacked a perceptible debate on its strategic political orientation. The protests in Banja Luka could provide a link for the Left to build on the foundation of an anti-nationalist, social, and above all regionally networked alternative to shatter the hegemonic nexus of nationalist and libertarian thinking. Additionally, the many local social movements and instances of resistance — protests against the construction of small hydroelectric plants, the continuous proliferation of evictions, the commodification of education and health care — are valuable points of entry in the process of building the political left as a visible and relevant force. The perspectives of a larger social movement encompassing all of Bosnia and Herzegovina could finally pressure the left-liberal parties enough to make them swap their mainly moral conception of politics for a genuine alternative looking beyond the neoliberal mainstream. Whether or not this is realistic remains to be seen. At any rate, the survival of the country’s radical left depends on its ability to establish its organizational and political strength acting through local struggles and wider social movements. Republished from Ada Magazin . Krunoslav Stojaković is the director of the Belgrade office of the Rosa-Luxemburg-Stiftung.